Since they rose from the ashes of Aironi in 2012, things haven’t always been easy for Zebre. They’ve finished rock bottom of the Pro12 in both seasons to date, and their European record read a rather unflattering 0 from 12 in the old Heineken Cup, recording just a single bonus point over two campaigns. And yet the signs of improvement are there – they did the double over Cardiff last season, and have started this season impressively by their standards – beating Ulster and Edinburgh at home in the Pro12, and notching their first ever European win over Brive. 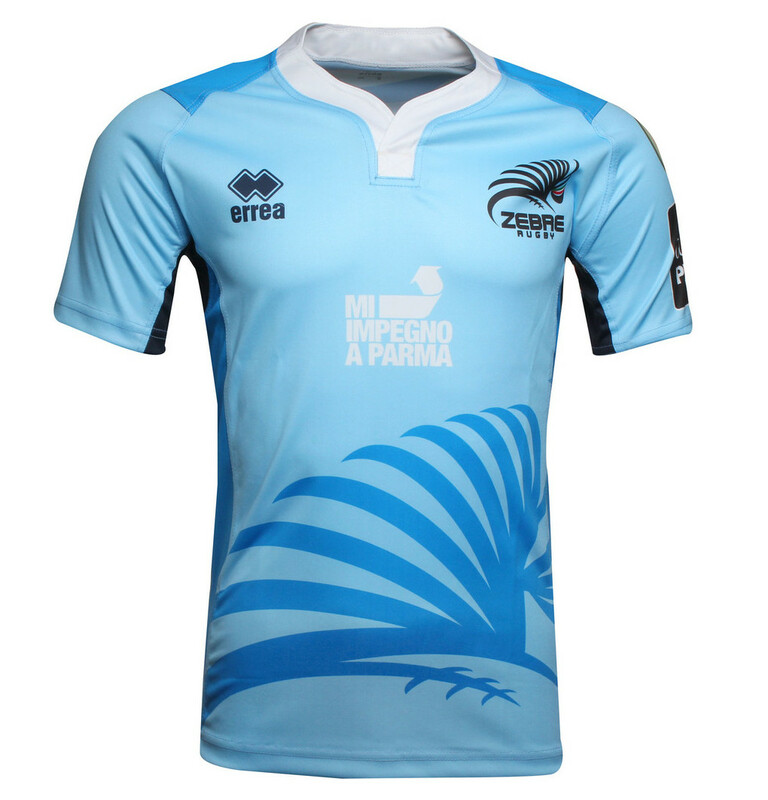 There’s been a bit of progression on the shirt front for Zebre this season, too – last year they had some fairly ordinary gear provided by Bristol-based company Zar-X, but this year’s shirts are produced by Italian sportswear institution Errea. And starting with the home shirt, you have to say they’ve done a very nice job. It’s a clean, simple design, keeping things zebra-y in black and white with minimal faff asides from the stripes on the bottom right of the shirt, which reflect the ‘neck’ part of the Zebre badge. We like the way they’ve been echoed with a grey shadow of those stripes, that makes it look a bit more modern and less 90s. 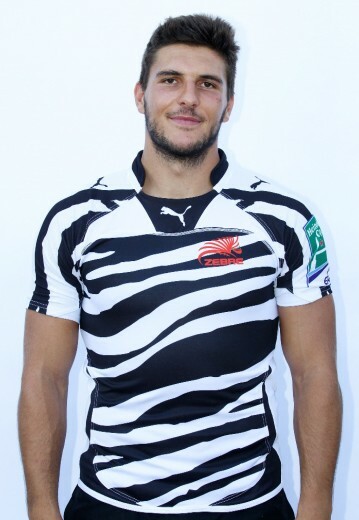 With just a subtle bit of black around the collar and some nice black side/under arm panels, it’s a perfectly inoffensive shirt that keeps things vaguely zebra-y (a key thing we like to see in a Zebre shirt) without going the full Puma zebra-stripe nightmare. You should never go full-zebra. First off, credit to Errea for not just doing a simple palette-swap for the alternate shirt. We don’t mind when teams do this per se, but it’s always nice to see a team trying to do something distinct from the main design with the away top. Here, we get the full zebra-head-meets-rugby-ball Zebre crest logo in fetching blue, against a very nice shade of light blue. We’re not sure why the side panels have been made blue while the under arm panels have been left black, though – combined with the white collar it all looks a bit of a mess. WHAT DID WE JUST SAY ABOUT GOING FULL ZEBRA?! 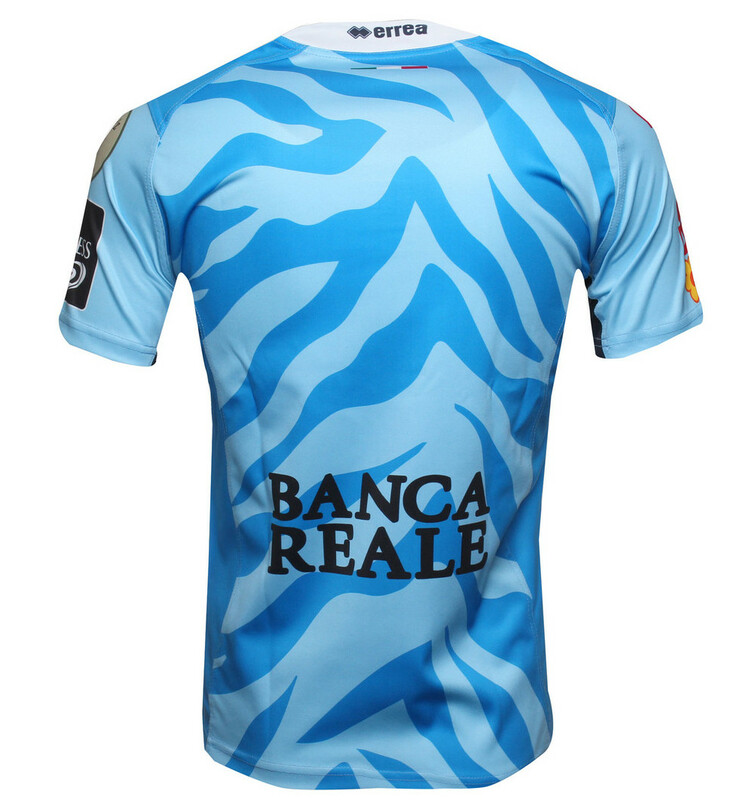 Yes, rather than keeping things clean and classy at the back, the designers at Errea have decided to flip the trend for this season, by going for a plain design on the front combined with something suitably batshit on the rear – in this case, some great honkin’ blue zebra stripes. Honestly, though, compared with the Puma effort, this isn’t that bad. It’s bad, of course it is, it’s animal print on a rugby shirt – that’s second only to camo in our list of Things That Don’t Belong On Rugby Shirts – but it could be worse. Zebre are putting a better product out on the field, slowly but surely. They definitely still need to put some work in when it comes to what they wear while doing it, however. 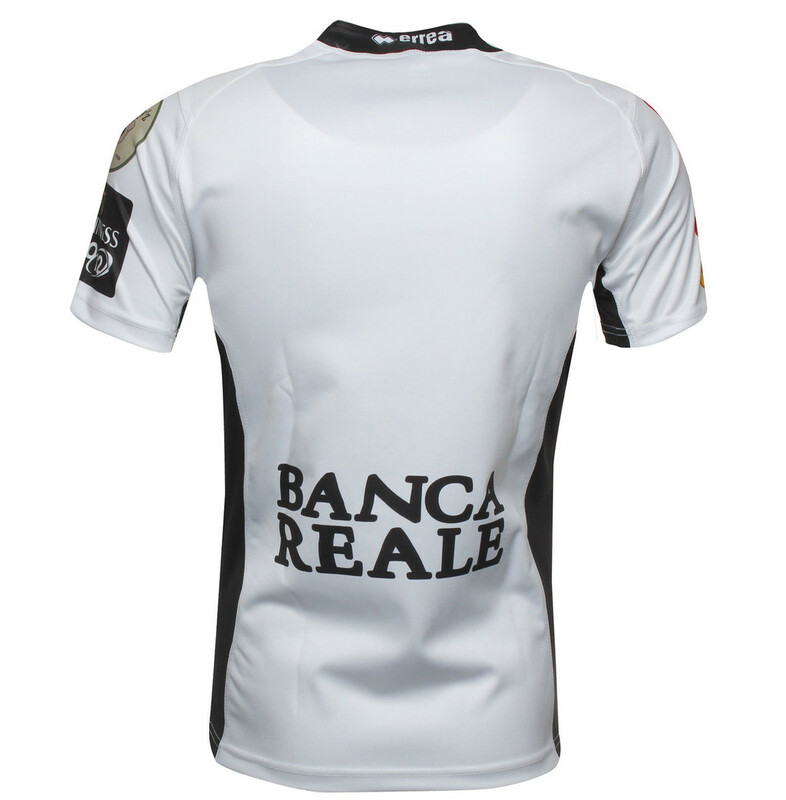 We like the home shirt, and the away shirt is only let down by its flirtation with animal print on the back. A passing grade? Maybe just.